The Brihat (the great) Yoga Vasishta or Yoga Vasishta Maha Ramayana as it is also called, is a work of about 32,000 Sanskrit couplets, traditionally attributed to Valmiki, the author of Srimad Ramayana. It is a dialogue between Sage Vasishta and Sri Rama, during which Advaita (the doctrine of non-duality) in its pure form of ajatavada (theory of non-origination) is expounded, with illustrative stories in between. This vast work was abridged some centuries ago by Abhinanda Pandita, a Kashmiri scholar, into 6,000 couplets, which go by the name of Laghu Yoga Vasishta. This is a masterpiece in itself, like the original Brihat. 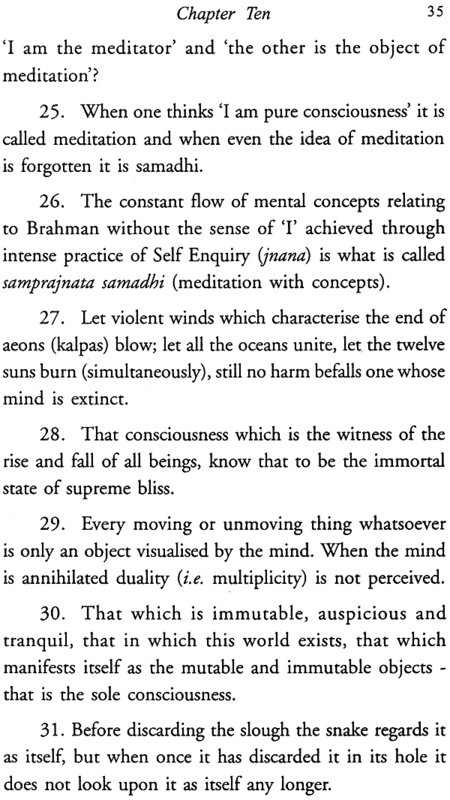 Bhagavan Sri Ramana Maharshi used to refer to Yoga Vasishta frequently and has even incorporated six couplets from it in His Supplement to Forty Verses (verses 21 to 27). A further condensation of this work was made long ago, by an unknown author, into about 230 couplets, divided into ten chapters, as Yoga Vasishta Sara (Essence of Yoga Vasishta). By making this condensation the author has rendered a great service to all sadhaks. This is indeed a goldmine fit for repeated reading and meditation. 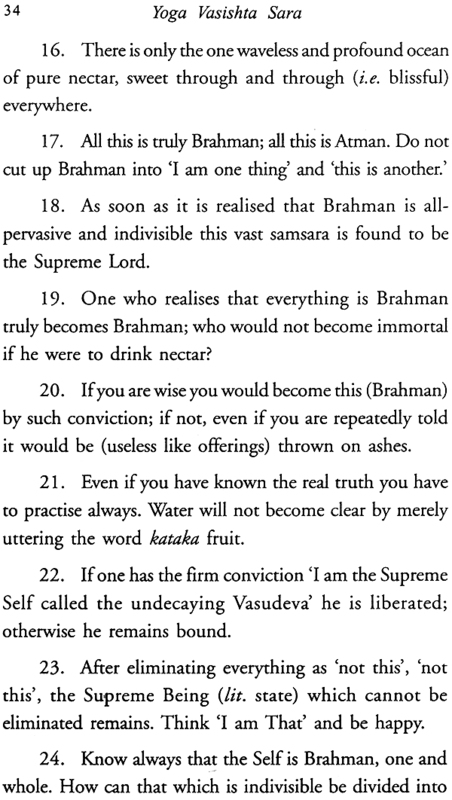 This English version of the Yoga Vasishta Sara is based on a translation made by Swami Sureshananda, an old devotee of Bhagavan, who has founded an ashram named 'Vijnana Ramaneeyam' at Palghat and has translated several works of Bhagavan as well as the Yoga Vasishta Sara into Malayalam. This was published serially in The Mountain Path, the journal published by Sri Ramanasramam, during 1969 to 1971 and is now issued in the form of a book for facility of reference. The Brihat (the great) Yoga Vasishta or Yoga Vasishta Maha Ramayana as it is also called, is a work of about 32,000 Sanskrit couplets, traditionally attributed to Valmiki, the author of Srimad Ramayana. It is a dialogue between Sage Vasishta and Sri Rama, during which Advaita (the doctrine of non-duality) in its pure form of ajatavada (theory of non- origination) is expounded, with illustrative stories in between. This vast work was abridged some centuries ago by Abhinanda Pandita, a Kashmiri scholar, into 6,000 couplets, which go by the name of Laghu Yoga Vasishta. This is a masterpiece in itself, like the original Brihat. 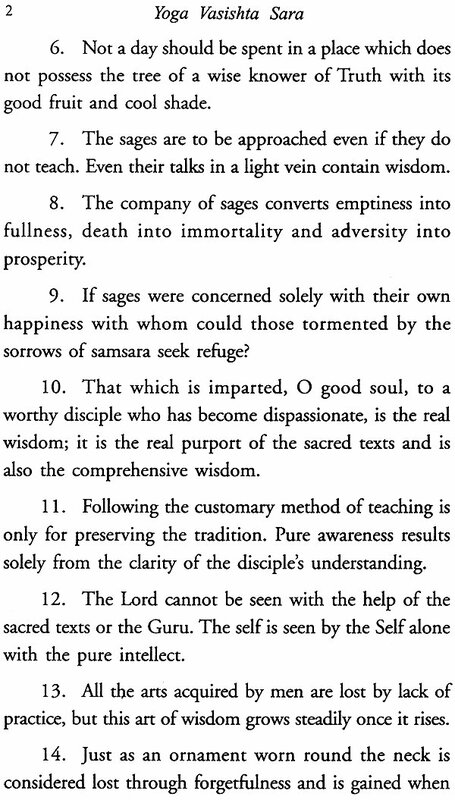 A further condensation of this work was made long ago, by an unknown author, into about 230 couplets, divided into ten chapters, as Yoga Vasishta Sara (Essence of Yoga Vasishta), of which this translation is presented for the first time. By making this condensation the author has rendered a great service to all sadhaks. 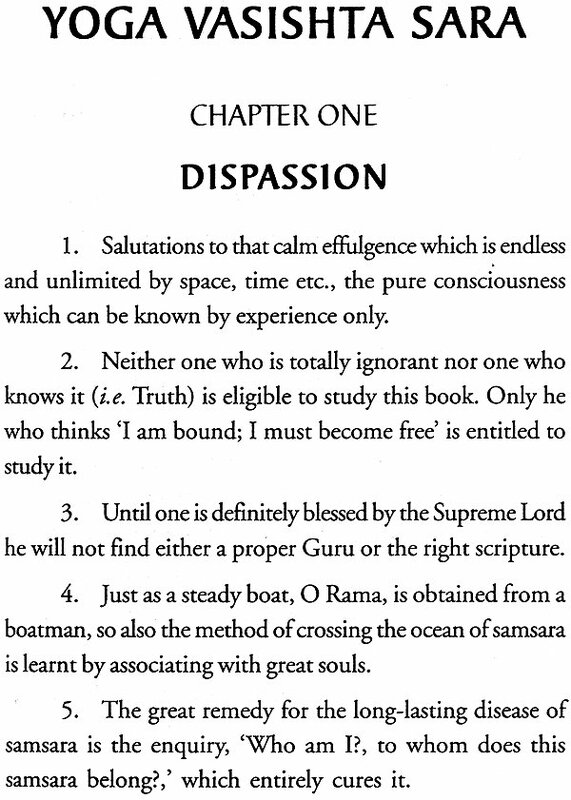 This is indeed a goldmine fit for repeated reading and meditation.